It's amazing to see a film about what many people consider the most boring of civic duties be tense, gripping, and exciting. 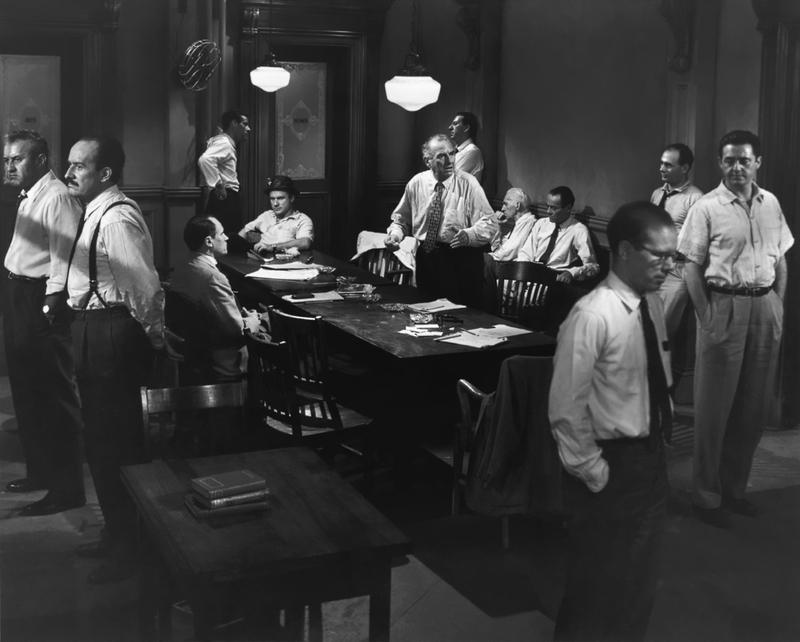 12 Angry Men takes place in a jury room, and many people do all they can to get out of serving on a jury. The film is simply a brilliant film about the importance of reasonable doubt. It appears a simple enough case: a young man from the slums is on trial for murdering his father. The twelve jurors now retire to their deliberations. On the initial count, the vote is 11-1 for conviction (which would carry an automatic death penalty). Only Juror #8 (Henry Fonda) votes to acquit on the grounds that he is unsure. The other jurors are at first merely irritated that an obvious case where all the evidence points to the young man's guilt could cause anyone to think he was innocent. As almost a pure formality, they agree to go over certain evidence to show Juror #8 he's wrong to doubt. However, as the deliberations go on, something strange begins to happen. As the evidence is reexamined piece by piece, certain jurors start turning from conviction to acquittal. There are some jurors, though, who will not be persuaded. Chief among them is Juror #3 (Lee J. Cobb), a bully of a man, who finds himself in league with Juror #4 (E.G. Marshall), the more intellectual of the group who, unlike the other jurors on this hot day, never perspires (or even removes his jacket). They have an erstwhile ally in Juror #10 (Ed Begley), who spouts off bigoted comments about those from the wrong side of the tracks. Juror #8's first and only real ally is Juror #9 (Joseph Sweeny), an elderly man who thinks everyone has a right to their say. Other jurors soon start getting drawn into these two camps: from the meek Juror #2 (John Fiedler) to watchmaker/naturalized American Juror #11 (George Voskovec), the pleasant but indecisive Juror #12 (Robert Webber) and jocular Juror #7 (Jack Warden). As the day goes on more and more of the jurors start rethinking their decision, and all their prejudices (pro and con) along with their past experiences soon start coloring their views on guilt or innocence. In the end, what started out as a 11-1 conviction vote turned into a painful 12-0 acquittal. What makes 12 Angry Men simply brilliant is that director Sidney Lumet (directing his first feature film after having directed the original teleplay) keeps things very simple both in terms of the locations and the performances. We don't shift from locations to locations, and by keeping us trapped along with the jurors in the room (with one shift to the jury room's restroom), we do get that "we are there" feel that allows us to be almost alternate jurors observing the proceedings. We also get perhaps the greatest collection of actors in some of their finest performances. Fonda stays close to his image of the upright liberal-minded figure, but his performance is a brilliant one, making Juror #8 a man who makes clear he isn't saying the boy didn't kill his father, only that he is unsure and unwilling to vote for conviction so quickly without giving it more thought. Cobb matches Fonda beat for beat as the bullying Juror #3, who is as determined to convict the kid as Fonda is to acquit him. However, Cobb gives us a more complicated man, who is haunted by his own frayed relationship with his son and which may cloud his views on the case. Each of the actors makes his character a real, fully-realized human being: the bigotry and hatred of Juror #10 (Begley), the bumbling attempts at authority by jury foreman Juror #1 (Martin Balsam), the dignity of Voskovec's Juror # 11, Juror #5 (Jack Klugman) who grew up on the same wrong side of the tracks as the boy on trial, the cerebral Juror #4 (Marshall), the genial but impatient Juror #7 (Jack Warden). All of them have their moment, each one slowly coming round to Juror #8's way of thinking but also of them arguing with each other, agreeing with others, seeing how things can change. These are all real men, with all the flaws and virtues that all of us have. In short, we can recognize at least one of them as one of us, and by allowing us the complexity of their experiences and views, we can believe the evolution of these characters thanks to Reginald Rose's screenplay (which he adapted from his own teleplay). If I were to find any fault with 12 Angry Men it is in the actual details. I can't claim to be a legal mind, but I think Juror #8 producing his own version of the murder weapon along with him saying he took a walk near the murder scene and was able to purchase a similar weapon (thus, showing he was investigating the case himself) would not be admissible in court. If I were Juror #1, I would immediately complain saying that Juror #8 a.) brought a weapon with him, and b.) was introducing evidence not part of the trial itself. Still, it isn't for the finer points of law that one appreciates 12 Angry Men. It is for the brilliant performances by one of the best casts ever assembled, by its exploration and celebration of the American system of justice, and by seeing that our system where a group of our peers decides our fate is one of the greatest achievements in human history. Perhaps that's hyperbole, but this is true: 12 Angry Men should make anyone appreciate that jury service, rather than a horror to endure, is instead a great duty. Next time I get called to jury duty, I may not get a murder trial, but will enter it with a realization that indeed, everyone deserves their day in court, and that I must weigh all the evidence to reach as fair and just a decision as my abilities allow. 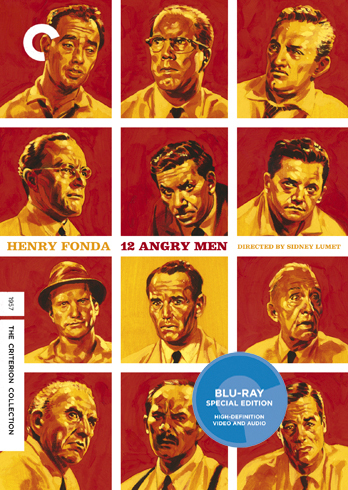 12 Angry Men is on my watch-list, and since it is currently on Netflix, I think I will probably watch it soon.